One of the wonderful things about the internet is that it makes doing research a lot easier for genealogists. That’s great if you are looking for vital records, photos of gravestones, or your ancestor’s high school yearbook. Just be careful before you merge your family tree or copy another genealogist’s research. Never assume someone else’s research is correct! There is an old game that kids used to play that was called “telephone”. Everyone sits in a circle. 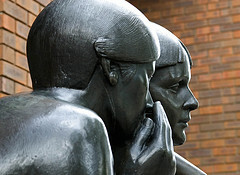 The first person whispers a sentence into the ear of the second person. That second person passes the whisper on to the next person. In the time it took for the first person to create the sentence, and the last person to whisper it, a strange thing happens. The sentence has changed so much it doesn’t match the original sentence anymore. This tends to come as a surprise for all involved. The rules of the game require everyone to pass along the sentence verbatim. Why did it change? It changed because mistakes were made. Everyone tries to repeat the sentence they were given, but not everyone heard it correctly. They honestly believe they are passing along correct information, though, because they are unaware of their mistake. The next kid in the circle assumes what they were told was correct – assuming that everyone was following the rules of the game. Genealogists need to keep the “telephone” game in mind when they are considering merging a family tree. It’s also a good lesson for genealogists who feel tempted to copy someone else’s research in order to fill in their own family tree. You cannot safely assume that the information you see is actually correct. Genealogy expert Megan Smolenyak wrote an article for Huffington Post that emphasizes why genealogists shouldn’t simply copy someone else’s research (or parts of their family tree). Take the time to do the research and discover the original source before you count someone as a relative or ancestor. Megan Smolenyak was asked to write about Hillary Rodham Clinton’s heritage. At first, she figured that she wouldn’t be able to find anything new to write about. Other people have done that research before, so what could she add? After digging in, she discovered that “dozens of people” had made mistakes. Someone accidentally included the wrong person into Hillary Rodham Clinton’s family tree. Others, who came across that mistake, assumed it was correct and repeated it. It is situations like that one that bring to mind the 12 Genealogy Research Rules. The first one is “Always cite your sources.” The second one is “Never, ever, assume another researcher’s information is 100% correct”. Genealogists who follow those two rules can save themselves the trouble of unraveling an incorrectly done family tree. Image by Brian Smithson on Flickr.